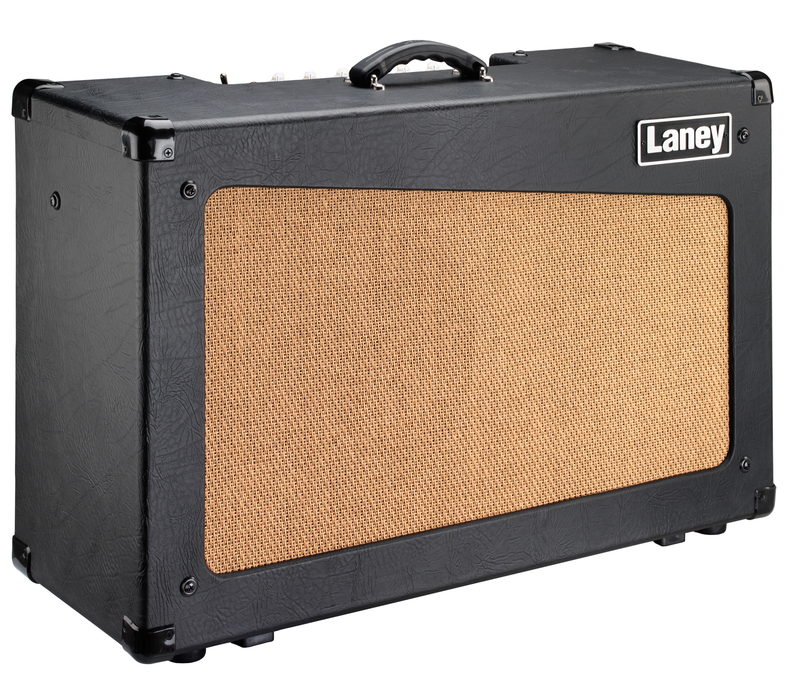 The Laney CUB212R is an all-tube combo that delivers warm, classic British guitar tones via 2x12" open-back cabinet design. Designed and engineered in the UK, the CUB212R draws on 50 years of Laney amp-building heritage. The CUB212R enlists the same circuitry as Laney's hugely popular CUB12R combo, but with the addition of a second 12" loudspeaker to move more air on stage. At 17kg (37.4lbs), the CUB212R is a remarkably portable twin 12" combo. 2 x EL84 power tubes combine with 3 x ECC83/12AX7 pre-amp tubes to deliver 15W RMS power with natural drive and warmth. Despite the CUB's competitive price, only carefully selected high-quality tubes make the Laney grade. The CUB212R uniquely offers a choice of input connections to opt for either the full 15 watts RMS power or <1W power. <1W means the player can still drive the amp's power tubes hard whilst playing at a lower volume level -- ideal for recording and practice without sacrificing tone. Selecting 15W allows for stage-ready volume levels. HH have custom-designed the dual 12" drivers exclusively for Laney giving the perfect loudspeaker pairing to the amplifier. Housed in an open-back cabinet these speakers provide a dynamic, responsive interaction with the tube amplifier. An integrated tilt stand on the underside of the cabinet gives another option to enhance projection and offer tonal variation. A rich-sounding reverb adds ambiance to the classic tone from the CUB212R. An FS1-MINI footswitch can also be used to switch reverb remotely. In addition to a three-band tone stack with Bass, Middle and Treble controls the CUB212R pre-amplifier also uniquely features a 'Tone' control at the back end of the signal chain. This provides the ability to not only control the overall top-end response but also reduce upper-end harmonics on the output stage and pre-amplifier overdrive sounds. Independent Gain and Volume control allows preamp drive to be balanced with the output level, progressing from warm cleans to rich overdrives. The back panel offers both an FX Loop (send and return) for connection of additional effects and a 1/4" jack output to extend the amplifier into an external cabinet (such as the matching CUB-CAB) to move even more air on stage!